Russian Grand Prix - Potatoes and Sausage, and cake! The Russian track at Sochi has a certain elegance as it winds through the Sochi Olympic 2014 park. The obvious choices for meals to make for Russia are Beef Strogonaff, Chicken Kiev or Borscht. Though I don't even think Chicken Kiev is actually of Russian origin, or at least the name is Americanized. I found a great blog this time around: Olga's Flavor Factory , I figured it could be fun to learn about some dishes that don't practically have the name of the country in the title. I was definitely tempted by the Roasted Duck with Apples and the Pelmeni, who doesn't love dumplings and roasted goodness too. Simple seemed better for this night though. Roasted Potatoes, Sausage and Peppers turned out to be perfect. Preheat the oven to 475 degrees F. Place baking sheet in oven to heat up in order to sear vegetables. Par boil potatoes for 5 minutes. Drain the potatoes and set aside. Meanwhile, in a large bowl, combine onion, bell pepper, mushrooms, olive oil, minced garlic cloves, and season with salt, pepper and a mixture of dry herbs. 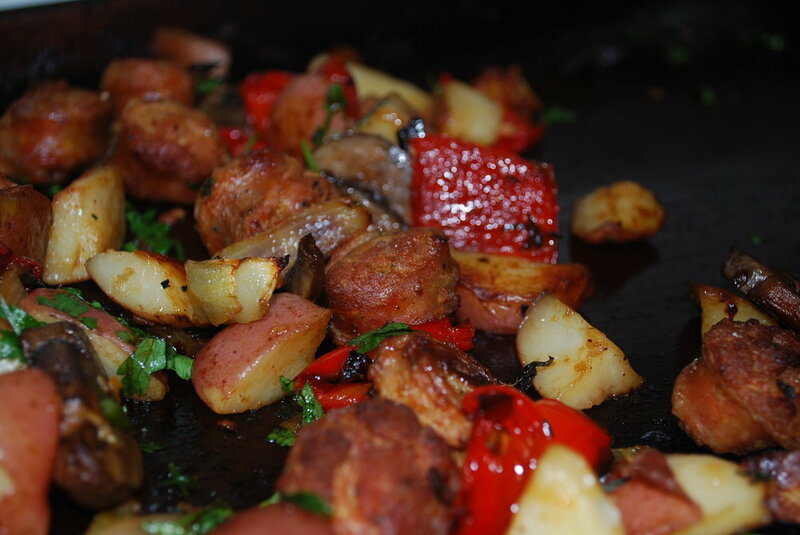 Gently toss par cooked potatoes with the mushroom and pepper mixture, along with the sausage. Spread mixture on hot baking sheet. Roast uncovered, for 20-30 minutes, until the vegetables are cooked through and golden brown, turning everything over halfway through cooking. Broil the dish during the last few minutes of cooking to give it a slight char. Preheat the oven to 350 degrees F. Grease a loaf pan with butter or baking spray. In a large bowl of a standing mixer with a paddle attachment, cream the butter and sugar until pale yellow and fluffy, 3-5 minutes. In another bowl, whisk together the flour, baking powder and salt until evenly mixed. Add half of the dry ingredients to the creamed batter, followed by half of the buttermilk and vanilla and so on until you've added it all to the batter. Divide the batter into 3 even parts. 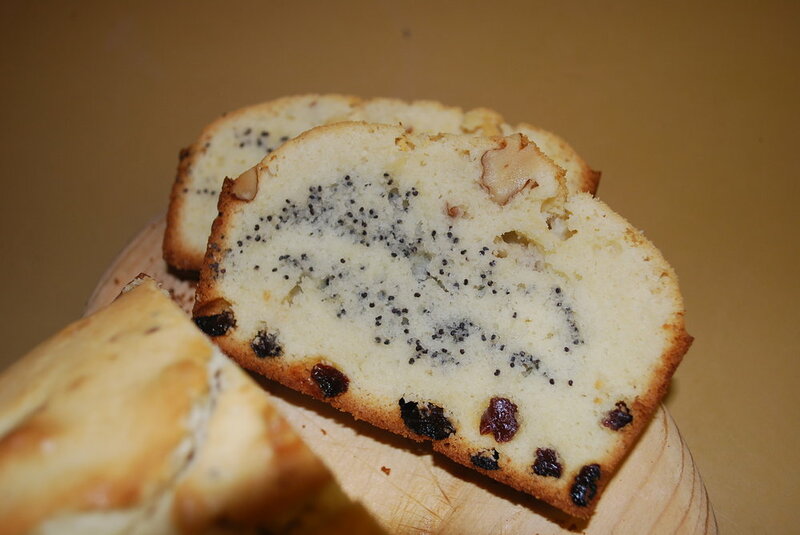 You will be adding the raisins, poppy seeds and nuts to each part of the batter. Add the raisins to the first part and spread it out evenly into the bottom of the prepared loaf pan. Add the poppy seeds to the second part of the batter and spread it out evenly over the first layer of batter. Finish by adding the nuts to the third part of batter and spread it out evenly over the poppy seed layer. Bake in the preheated oven for 30-35 minutes, until a toothpick inserted into the center of the loaf comes out clean. Let it stand in the loaf pan for 3-5 minutes and then take it out and set it on a cooling rack. *If you don’t have buttermilk, add one tablespoon white vinegar to a cup of whole milk and let sit for at least a minute, to make buttermilk substitute. Olga also tells a sweet story about this loaf cake and the Three Wishes Keks. Last but not least, the Russian Grand Prix experience would not be complete without a Moscow Mule. Classically served in a copper mug, add ice, vodka, and lime juice. Top with ginger beer and garnish with lime.